Today is a very special day for me and I can’t believe how fast it seems that these years have passed. It seems like yesterday, that every March 7th, I would be wrapping up a sandwich, a juice box and a cup cake in birthday wrapping paper and sending Mark off to school with his lunch box.﻿ Yes…today my baby turns 25!!!! Happy Birthday Honey!!!! Dad and I are so proud of you!!! Love You!!! If you follow this blog, you won’t be surprised with part of this answer. Vincent Zandri has a sequel coming out to his Moonlight Falls and I have been informed that he has another new book coming out this spring titled Concrete Pearl that I am also anxiously waiting for. But as a book addict, I can say that every book that is either on my TBR shelf or TBR list is a book I can’t wait to read. Whenever I pick up a new book to read, I am always thinking which is going to be my next read. I first want to thank Laura for being so kind and generous to take the time to host this month with one of my favorite memes. Thank you Laura!!!! Wow, isn't it amazing how fast our "babies" grow up? Bittersweet moments…. Your mailbox looks great…Radioactive Lady captured my interest. The Sweetest Thing looks like a book I would enjoy. Another one for my TBR list. I don't get books in the mailbox, but I did get a few at B&N this week. Enjoy the books, and look forward to the reviews. Happy Birthing day to you too! It's amazing our babies grow up so fast…in a blink of the eye it seems. The Revenge of the Radioactive girl looks really good. Happy Birthday, Mark!! Woot! (Cheryl, I know .. I keep looking at my oldest who is 27 and just shaking my head – she was just a wee tot yesterday it seems). Great mailbox! I also received Song of the Silk Road this week (isn't that cover gorgeous?). The Revenge of the Radioactive Lady seems as though it will be a fun read, too. 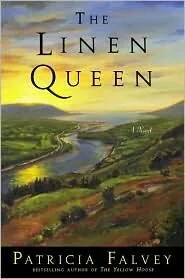 I also want to look up The Linen Queen; I'll look forward to your review on that one! We both have a "Mark" with birthdays in March? Come on! This is too much, C! OK..mine is a bit older as going to be 37 but still…Happpy BD to your Mark! happy B day to Mark! WOW wasn't it yesterday that he started kindergarten?? Time flies and it's only looking at our kids that we see ourselves in real time… Heck I still think I'm 27 on a good day! Nice mailbox. I'm looking forward to The Linen Queen. Awwwww……happy bday to Mark! Your baby isn't too much older than my baby….. They will always be little till you see them towering over you! Happy Bday to mark. My baby will be 25 in July! I was just reading about Song of the silk Road the other day and thought it sounded wonderful! You got some other great books as well. I hear you about the time going by so quickly..I still can't believe my daughter started college this year. My eldest just got her first bank account with debit card this weekend. She officially leaves compulsory school next term!